In keeping with this tradition, Shakespeare’s Twelfth Night has its share of mischief, using disguised identify of the sexual variety, with a plot that tangles and untangles several romantic relationships. Two-look alike twins, Viola (a young woman) and Sebastian (a young man) are shipwrecked in Illyria, but unaware that the other has survived. Disguising herself as a man, Viola goes to work for a rich countess, Oliva, which begins an incredible series of hilarious topsy-turvey love triangles; along with some unorthodox servant-master bonding and attempted bonding. The director, Jon Ketzu set this production in the Jazz age, which was an era which reflected the gender bending of the play. Women’s fashions, mostly as a result of the effects of World War I, and Coca Chanel, liberated women from physical constrictions like corsets, which emphasized an exaggerated femininity, and put women in very androgynous attire; dresses which deliberately de-emphasized femininity, abolishing waist-lines and favoring flat-chests. The Jazz Age theme worked well enough, however, at times it seemed at odds with the flowery Elizabethan language. As the stage is rather small and the audience sits very close, Andrea Bryn Bush, the set designer used very little furniture and decorated the ceiling with umbrellas, which was a creative, economical use of the space and livened things up a bit. The acting was solid, Jay Meyers as Duke Orsino, was touching, self-indulgent, youthful to the point of childishness, as was the object of his love, Olivia, played by Elinor Gunn. Viola, played by Allie Pratt, playfully captured both the humor and confusion of her situation. Christopher Morson, playing Sebastian, the look-alike twin brother, brilliantly managed to reproduce his twin-sister’s physicality and speech patterns, thereby escalating the bedlam even more. Representing the decaying aristocracy, Mike Dooley’s performance as Sir Toby Belch (get it?) was convincing as a coarsely funny chronic inebriate. Dooley’s physicality and vocal ability was nothing short of admirable. As Sir Toby’s mistress, Maria, Julie Briskman put in a vibrant performance as she deviously hatched a plot to expose the Puritan servant, Malvolio, played brilliantly by Seattle Shakespeare veteran, David Quicksall. In contrast to Sir Toby’s bullying, George Mount as Sir Andrew Aguecheck provided superb comic relief. Choreographed by Peter Dylan O’Conor, the sword scene had a small unexpected twist in it. Stuck in the middle was a comic interlude, showing that the director and Seattle Shakespeare Company will not forego any chance to keep Shakespeare alive by entertaining the audience with which is now called a Rom-Com. Shakespeare may be part of the revered literary cannon of Western Civilization but the production demonstrated that it is still the best romantic comedy on the planet. Twelfth Night or What You Will, Seattle Shakespeare Company Center Theater (Armory ) at Seattle Center. 305 Harrison, Seattle 98109. Sunday, on Wednesday – Fridays at 7.30 pm, Saturdays 2.00 pm and 7.30 pm and Sundays 2.00 pm and 7.30 pm Center Theater at Seattle Center Theatre . Thru November 16. 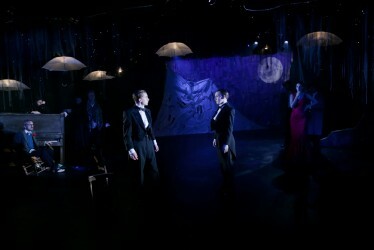 Tickets, call (206) 733-8222 or visit www.seattleshakespeare.org (discount for groups of 10 or more).